The Kenya Trade Network Agency (KenTrade) has today signed a partnership agreement of One Hundred and Fifty Million Kenya Shillings (USD1500000) with TradeMark East Africa (TMEA) to support the enhancement and usage of the National Electronic Single Window System (Kenya TradeNet) and implementation of the Maritime Single Window in Kenya. 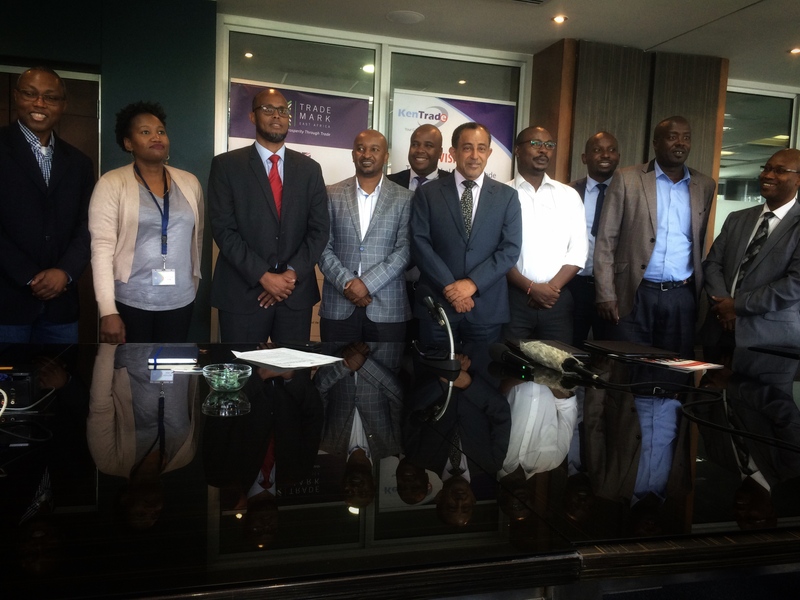 The agreement was signed at TradeMark East Africa offices, Nairobi by KenTrade Chief Executive Officer, Amos Wang’ora and TMEA, Kenya Country Director, Ahmed Farah in the presence of the Chairman of the Board of Directors of KenTrade Mr. Suleiman Shahbal. Speaking at the event, TMEA Kenya Country Director Ahmed Farah said confirmed TradeMark’s commitment in promoting and ensuring trade and business is transacted through a transparent means to achieve its prosperity. ”Trademark East Africa is committed to growing prosperity through trade in the Eastern Africa region. We recognize the impact of the single window on the trade value chain. That is why, we are committing to support the enhancement of this system in order to increase its capacity as an effective trade facilitation tool. It complements with our other investments at the port of Mombasa, with Kenya Revenue Authority, and at various one stop border posts.” He said. Mr. Wang’ora added that TradeMark has so far registered 11,400 users in the National Single window, with 36 Government Agencies onboard. More than 1,707,642 permits have been processed it was launched. Implementation of the Kenya TradeNet System commenced in 2012 and the system was rolled out in 2013. By start of 2019, KenTrade had successfully implemented 21 modules and their functionalities in the Kenya TradeNet System, with over 11,500 registered users and 36 Partner Government Agencies (PGA’s) onboard the System. More than 1,707,642 permits have been processed through the TradeNet System since it went live. In addition, the business community has realized savings estimated at US$25.36 million (KShs. 2.5 billion) as traders compliance costs associated with transport/travel, time and telecommunication have been reduced or eliminated. As part of the Partner Support Agreement, TMEA is set to support KenTrade in the implementation of the Maritime Single Window (MSW) to comply with the International Maritime Organization Convention on Facilitation of Maritime Traffic known as FAL Convention. Kenya is among the 120 member states that have ratified the FAL Convention. The partnership between TMEA and KenTrade has been on-going for a number of years. Previously TMEA has supported KenTrade in designing a business model and tariff regime to ensure the sustainability of the Single Window System services. TMEA has also partnered with KenTrade in building the capacity of a number of Partner Government Agencies and integration of their systems with the Single Window System.